This will be a very important tool to follow when a storm or hurricane threats any area of the U.S coast from the GOM going thru the east coast to Maine. Anyone who may want to discuss about this can come and do so anytime. Interesting! I just looked and the had a map up for the SE coast, from Florida up to the Carolinas. Looks like a loy of the areas where water touches land, will experience flooding. Not sure how accurate it is, or what flood heights (storm surge) they are using for this. Though it is in its experimental stage, it may not be very accurate, and is just list areas of possible storm surge. Here is useful updated information released on November 6 2014 about the new Storm Surge Map. NHC new guidelines and maps about storm surge. Hmm, very useful. I have a feeling I will be using that tool a lot this season. EyewallKnight wrote: Hmm, very useful. I have a feeling I will be using that tool a lot this season. Unless you are a crazy person(wait I know about this! ) as a chaser yes you will/should!! Note that the storm surge map above is not a forecast, it's a probabilistic map. Let me explain. As an example, let's say you look at the map and for your area you see that the potential inundation is "greater than 6ft" (but less then 9ft). It does not mean that the forecast for your location is for a storm surge causing 6-9ft of inundation. It means that the surge (inundation) for your location has only a 10% chance of being higher than 6-9ft. Conversely, there's a 90% chance that the surge will be 6-9ft or lower. Basically, the map says that the surge at your location could result in an inundation of 6-9ft, but only if the hurricane makes landfall at a point which places your location in the zone of maximum storm surge and if the hurricane makes landfall at the predicted intensity & wind field size. Therefore, the map attempts to identify a worst-case scenario for a given location. There's only a 10% chance that the surge could be worse than what the map identifies. wxman57 wrote: Note that the storm surge map above is not a forecast, it's a probabilistic map. Let me explain. As an example, let's say you look at the map and for your area you see that the potential inundation is "greater than 6ft" (but less then 9ft). It does not mean that the forecast for your location is for a storm surge causing 6-9ft of inundation. It means that the surge (inundation) for your location has only a 10% chance of being higher than 6-9ft. Conversely, there's a 90% chance that the surge will be 6-9ft or lower. Yes. This is very important. It identifies the 10 percent exceedence which can be thought of as the "reasonable worst case scenario". If you're in the 6 to 9 foot area, there is a really good chance you won't see 6-9 feet. However, a 10% chance of 6-9 feet is worth evacuating for. It's not a 10% chance of 6-9 ft, it's a 10% chance of being HIGHER than 6-9 ft. The chance of over 6ft is greater than 10%. Yeah. My mistake on the wording. I see potential for confusion between this product, and local products which take model output for an upcoming event and actually map the predicted storm surge over LiDAR topopgraphy. Maybe I'm over thinking it. mitchell wrote: I see potential for confusion between this product, and local products which take model output for an upcoming event and actually map the predicted storm surge over LiDAR topopgraphy. Maybe I'm over thinking it. What local product? NHC will issue one national map for potential storm surge flooding that includes flooding above ground. I'm sure there are others out there. 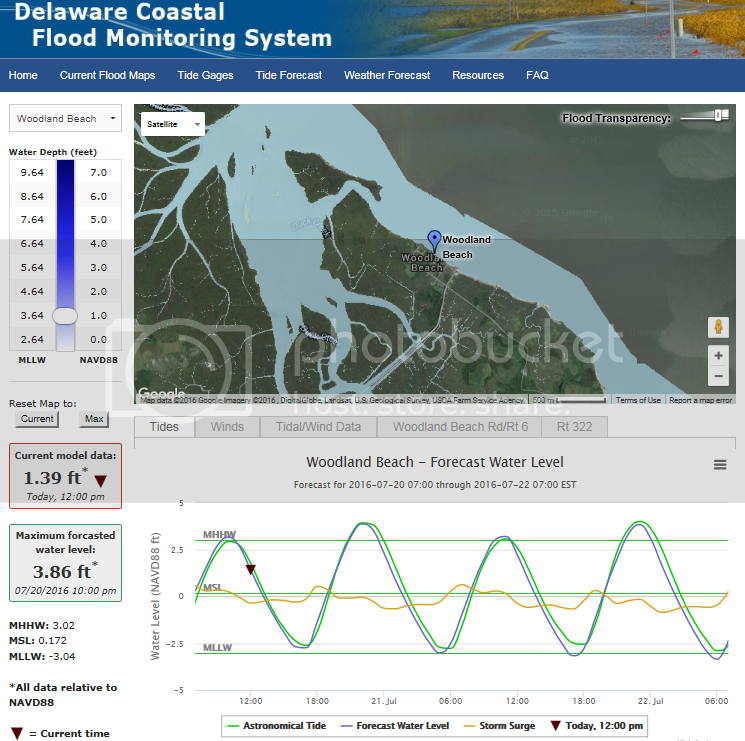 For example, the University of Delaware maintains an application that takes storm surge model output at selected locations along the Delaware coast and graphically depicts projected inundation areas with flood depths, flood depths above evacuation road profiles etc. No coastal flooding predicted for next 48 hours, but you get the idea...the surge model output is mapped over LiDAR data, with the ability to also load in evacuation route profiles. Thats what the NHC product is except on a national level. It takes the P-surge output and maps it to a city/street level showing how high above ground (using high res lidar data) the surge may get. You can't represent the surge threat using a deterministic track over LiDAR topography. In most cases, such a plot is guaranteed to be wrong. To be correct would require a perfect forecast of the landfall point, wind field size/distribution, wind speeds, and timing of arrival (effects of tides). I did a 10-yr study of landfall forecast points for 24, 48, and 72 hrs from landfall. I think the average error just 24hrs out was just over 45 miles. A 45 mile error could mean the difference in a large storm surge or tides below normal at landfall. That's why it's important to go to a probabilistic approach that discusses how high the surge could get as more of a worst-case. People have to react/respond to the potential storm surge, not a deterministic surge forecast based on the current track/intensity/size forecast. Of course, if every forecast was absolutely perfect then we could use the deterministic forecast to predict the exact surge height. What the public have to understand is that if they live in a location where they could get inundated by 6-9 ft. of storm surge, then they need to prepare for the possibility of such a surge, even though there's a fair chance the surge will turn out to be less than that. We won't be really sure what the surge might be until the center is an hour or two from landfall, and that's too late to take actions. A common example given by NHC on this is Ivan. 24 hours before landfall, a deterministic forecast was predicting devastating surge for Mobile Bay and relatively small surge for Pensacola Bay. Since the storm ended up making landfall just east of Mobile Bay instead of to the west of it, Pensacola got the devastating surge while Mobile Bay had limited storm surge. Thats why the NHC product uses a probabilistic model (P-surge) that perturbs size, intensity, direction, and speed. Small changes in track (everwhere) or forward speed (especially on East Coast where there are larger tidal swings) can be the difference between 20 feet of surge and 2 feet of surge. From my understanding there is not an official deterministic forecast product issued by NWS/NHC (e.g. Location X will get 5.3 feet of surge). Even in the past saying Location X will get 4 to 8 feet of surge is pretty much a probabilistic forecast in hiding. Most people aren't expected to understand the map. Thats what the storm surge watch and warning is for. The best part about the inundation map is how it will help decision makers. In the long run it will help limit unnecessary evacuations. P-Surge will do a better job that just evacuating on MOMs and MEOWs. That was my original point about potential confusing between local sources that are making deterministic surge forecast maps available (such as the site depicted above) and the NWS disseminating surge products pre-event which are not actually forecasts of the surge event.